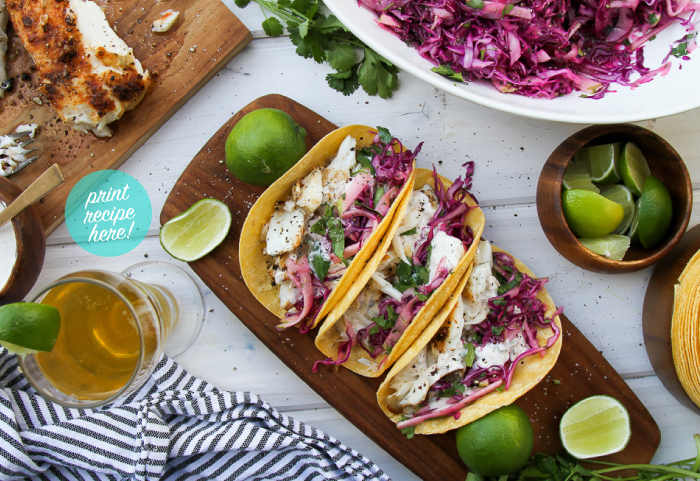 Turn your deck or patio into the best taqueria in town with hese halibut tacos! The flaky, fresh halibut is perfectly complemented by super finely shredded slaw and a generously drizzle of spicy crema. The marinade is simple, and the grilling couldn't be easier - a perfect summertime dinner! 1. Marinade the halibut in a mixture of the garlic, paprika, cumin, cayenne, olive oil, salt and pepper. Cover and refrigerate for 15 minute to allow the flavors to meld and permeate. 2. Meanwhile, prepare the slaw dressing by whisking the honey, lime juice, olive oil, and salt. Prepare the cabbage, apple, and red onion by slicing very thinly with a handheld mandoline. Mix the veggies with the cilantro and the dressing. Allow the flavors to combine for 30 minutes. 3. Brush a grill pan with oil and heat over medium high heat until hot. Place the marinated halibut in the hot grill pan. Cook without moving the fish for 3-5 minutes, or until the underside is opaque and is beginning to have visible grill marks. Then, carefully flip the fish to the other side and grill for another 3-5 minutes. Check for doneness by ensuring the interior of the fish turns from translucent to opaque. Specific timing will vary according to the size of fish pieces and the grill heat. Transfer the cooked fish to a plate for serving. 4. While the fish grills, whisk the spicy crema ingredients until evenly incorporated. 5. Warm the tortillas on the grill. Assemble the tacos by adding shredded pieces of the grilled halibut, a scoop of slaw, a drizzle of spicy crema, and a lime wedge on the side.